These are so yummy and versatile! Here in Texas, many people have pecan trees. We are not one of the lucky ones, but we do have several neighbors who do. When I go for walks with my daughters, sometimes we collect a few that the squirrels have not gotten to yet. My 3 year old thinks it’s the coolest thing ever. 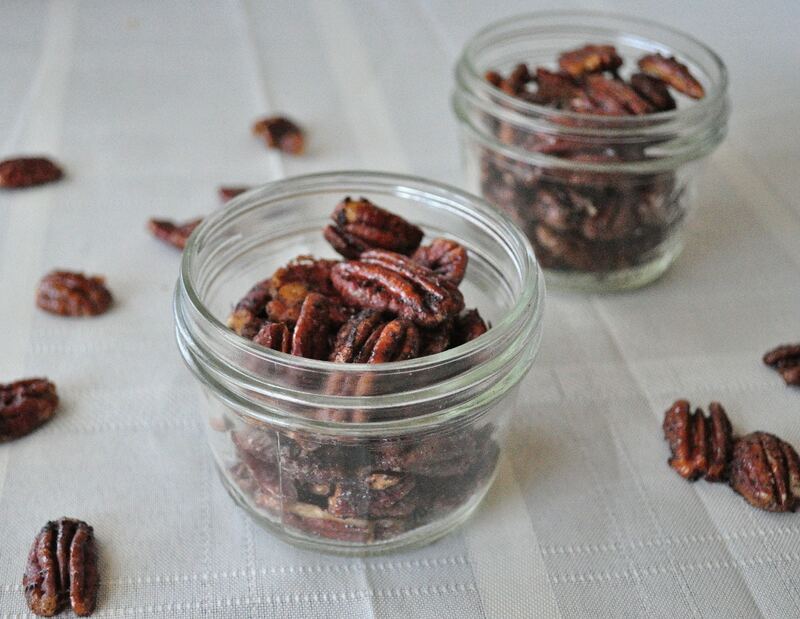 These candied pecans can be used in so many ways. You can toss them into plain yogurt, add them to cereal, throw them on a salad or just eat them straight up to curb a sweet tooth. In a bowl toss the pecans in maple syrup. If using extract, add that too. Once the nuts look well coated, spread them out onto a parchment lined baking sheet. Sprinkle the vanilla bean over the pecans and place in the oven. Bake for around 15 minutes, stopping halfway through to shake them pecans around a bit. Enjoy! These look great. I always have pecans in my pantry and I like to add them to salads. Usually I just toss them in raw, but tonight I think I will try this recipe for something different. Thanks. You're welcome. Hope you enjoy them! We love our salads! Thanks for the yummy idea! Hi Melissa! Can I use honey instead of maple syrup? will it work? pls. suggest! Looks delicious. I am eager to try this. Are crushed vanilla beans just the seeds or the whole bean? By that I mean, should I grind up a whole bean in the food processor or use only the seeds? I'm not sure. I think it might be the whole bean and the seed ground up. When I made these, they were burnt by the end of the time. I should have watched them more closely. But I was curious about why the difference in temperature between these (375 degrees) and the Sweet and Spicy Almonds (325 degrees). They are both in the over about the same amount of time. Shall I lower the temperature for the pecans, or shorten the time? Ten minutes cooking time was enough for mine! These are scrumptious and SO easy. Yum!